What I love about this recipe is the I can customize the filling with whatever meat and veggies I have on hand. Any recipe where I can clean out the produce drawer is a major winner in my book. If you use the smaller mini demi baguettes you could eat the whole thing by yourself. Or if you can only find the large baguettes once baked you can slice it into little egg boats slices and serve as part of a brunch buffet. Pair them with a fresh green salad and serve them for lunch. You see there is so much to love about a simple baked egg boat. 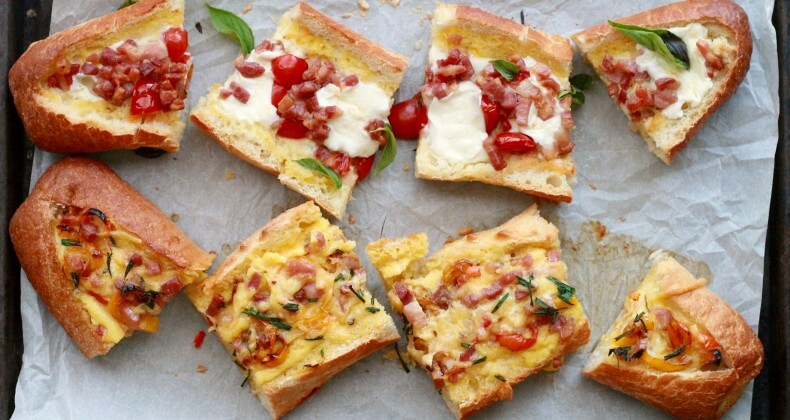 Baked egg boats are very much a lazy person’s strata (no judgment!). I LOVE stratas however stratas need to rest overnight before baking. Sometimes I just don’t think that far ahead. No worries the egg boat will give you very similar results without the wait time. Woo! My baked egg boats are filled with sautéed sweet peppers, crispy fried pancetta, halved grape tomatoes, topped with shredded Gouda and fresh mozzarella. It is what I had on hand. This week’s baked egg boat would be filled with leftover grilled bratwurst and sauerkraut because that is what’s in the fridge today. So you see fill these babies with whatever you want. Get creative! 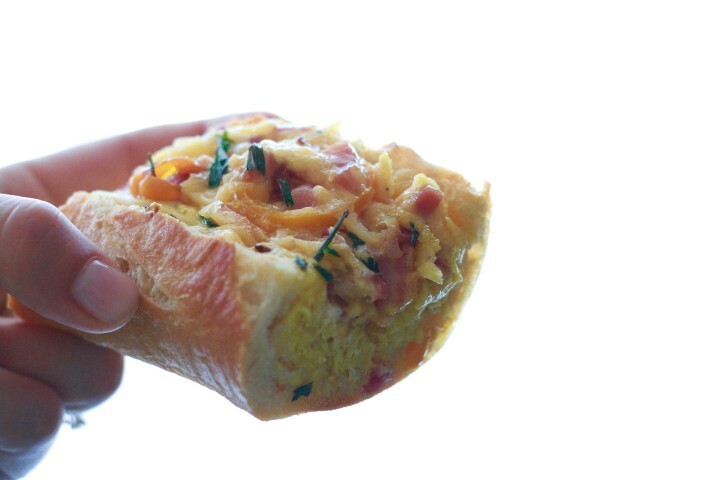 Let me know what sort of filling your baked egg boat would have if you were cleaning out the fridge today. Scoop out the loose top and a bit of the insides to make the "boat"
YUM! This looks great! I also love a recipe that can be customized to whatever I have in the fridge/produce drawer! I think we are having breakfast for dinner tonight! This is amazing! 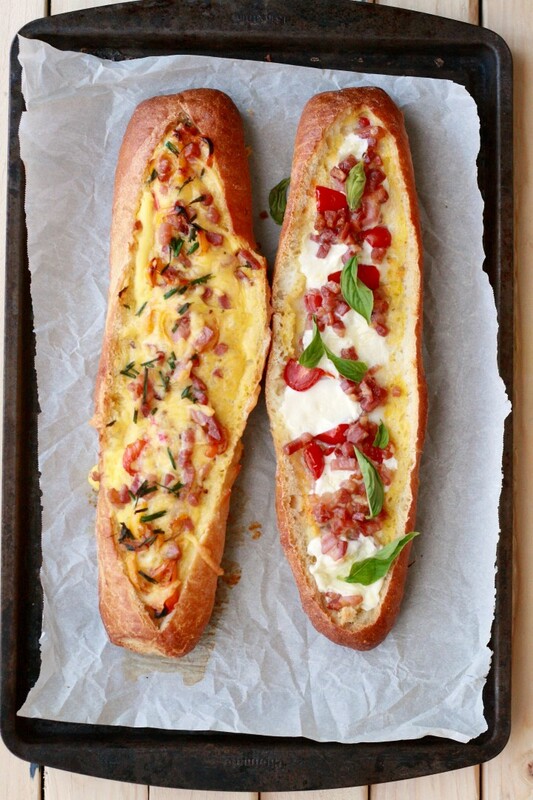 I love breakfast too and these baked egg boats look super delicious! I have so much to learn…I don’t even know what a strata is? hmm..I love eggs for breakfast. One more day of this detox and I’m back to my eggs in the morning. Strata is fancy for egg bake 😉 Being an Iowa girl you have certainly had an egg bake right?! Totally pinning this!! I have never seen anything like it (have I been living under a rock?!) My husband would love this as would weekend visitors. Thanks for the inspiration! i love recipes with eggs..and this one looks wonderful, very creative! Thanks Dixya! I am so glad you stopped by. These look delicious. Great party food. Thanks for sharing. Thanks Chanelle I think it would be fantastic at a party or baby shower/bridal shower. Um, WHAT?! I did not even know this was a thing! These look amazing! Breakfast is my favorite meal of the day, and I love finding new things to cook up. This is great! This looks like a fabulous option for weekend breakfast or any night of the week dinner. Thanks for sharing! Yum, these look so great! I love adding peppers for color in our food.